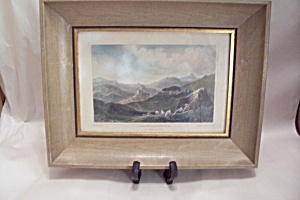 Nice vintage hand colored original print titled "Castel Buono". Drawn by P. Dewint, engraved by Cha. Heath and Robt. Wallis, and published by Rodwell & Martin, New Bond Street, London in March 1821. Glass dust cover. 7" by 9" and overall with frame is 10-1/2" by 13-1/2". Purchased from Rudolph Lesh Fine Arts, Inc in 1950s.